Steve Cunningham: “We have a solid gameplan for Tyson Fury on April 20th"
Media Day Workout Report – The Theater at Madison Square Garden will once again host Major Boxing action when Philadelphia’s Heavyweight pride Mr. Steve “USS” Cunningham enters the ring on April 20th, under the big lights for a 12 round face-off with the English giant, 24 year old Tyson Fury. 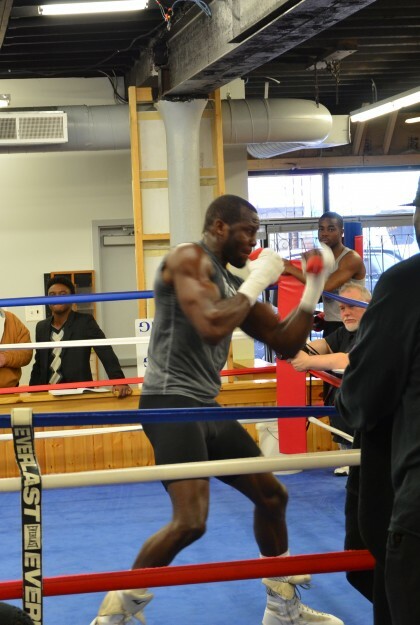 On Wednesday, April 3rd, Cunningham held a media workout at the Rock Ministries Gym in “The City of Brotherly Love” and had more than a few things to say about where he’s been, where he’s at and what’s in store for Fury. Cunningham is lean as a world class sprinter. There is just no fat to be found on him and he plans to gradually gain a few more “muscle” pounds all the way up to the weigh-in on Friday, April 19th. His workout demonstrations for the media in attendance indicated that he is in top physical shape, mentally sharp and properly synchronized with Nazeem Richardson’s formulated game plan and adjustments. The twelve round IBF Title Eliminator, “Tyson Fury versus Steve Cunningham” is slated to be broadcast on NBC, April 20th, 4PM EST. Tickets for the MSG event are priced at $25, $50, $100, $250 and $500. Use either the MSG box office or at ticketmaster.com to purchase your tickets. Next boxing news: Rigondeaux CAN beat Donaire!